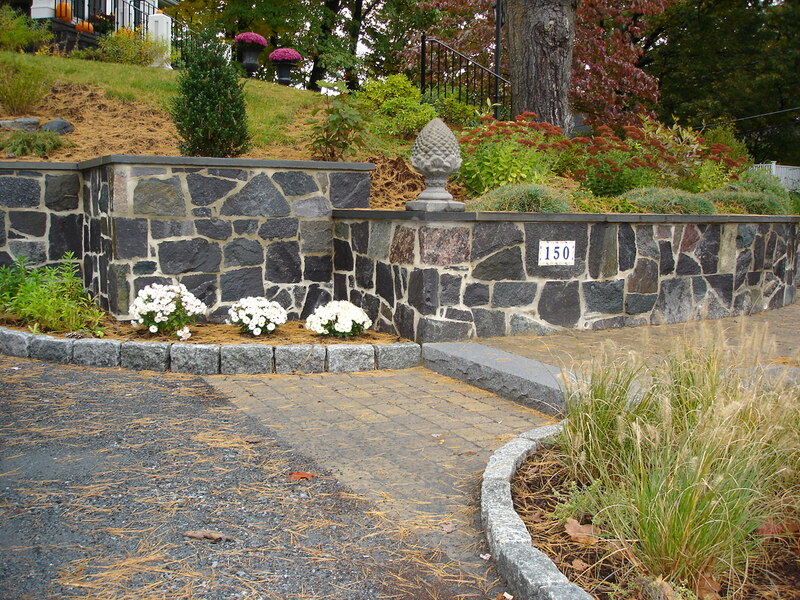 When you’re considering building a retaining wall you’ll want to make sure you’ve planned ahead of time to figure out the materials you’re going to use, how solid the ground is and how you want it to look. 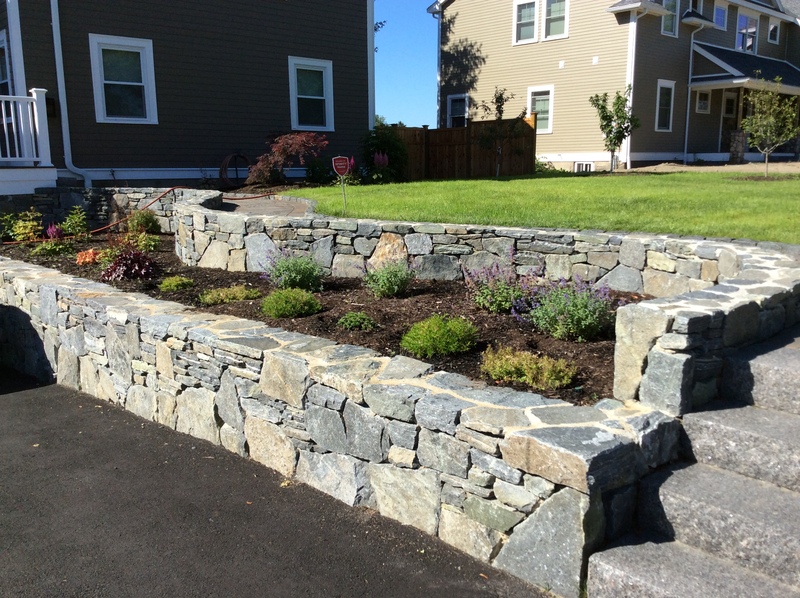 There’s a lot more that goes into building a retaining wall than just the materials, and if it’s not constructed properly it could lean, separate or even fall down over time. It’s much more difficult to rebuild a retaining wall than it is to build it right the first time. First, you’ll want to decide on the materials and types of stones that you want to construct your retaining wall out of. 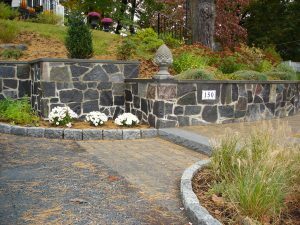 Depending on the look you’re trying to go for, you could use materials such as cement blocks, stones, concrete or segmental retaining wall blocks. Most people think that their retaining wall needs to hold back the pressure from the soil it’s being built against, but it actually only needs to retain an elongated wedge of soil, as gravity directs most of the weight and pressure of the soil towards the bottom of the wall. To construct a quality retaining wall, make sure to use clean, granular crushed stones under the base to create a firm foundation if you’re not already using poured concrete. Proper drainage and compaction will determine the quality and longevity of the wall once it’s completed. Understanding the properties of the soils that you’ll be working with is important to building a more stable wall. Different soil types will affect the time needed to compact your base, the proper reinforcement you’ll need, the type of drainage required and the overall cost of the project. In most cases, granular soils will be better to build your retaining wall than clay based soils. Materials like sand and gravel will actually compact better, drain more effectively and may require fewer reinforcements to remain stable. To begin your layout, put stakes that represent the positions of the front of your retaining wall. You can use paint or a string line to mark the entire wall length. If you’re laying out a curved wall, you could even use an average garden hose or a thin PVC pipe to lay out the curves. Begin your excavation by removing any vegetation or organic materials from the area. Do not use these materials for backfilling. Starting at the lowest point, dig a base trench that is approximately 24 inches wide, 6-12 inches deep and extends to the entire length of your wall. You will need to compact the base trench by making at least two passes with a plate compactor or similar equipment or until it reaches 95% of the required Proctor density. This step is very important, as the foundation soils for your retaining wall must be extremely firm and solid in order to support it. If your natural soil is made up of a heavy clay material, you’ll want to remove it and replace it with a more granular material made up of course sand and gravel to provide a more stable base. Once you have your base materials firmly compacted, you’re ready to install your drainage pipe (if needed) and begin your retaining wall construction. If you have any questions please feel free to call us and we will gladly help you or we can provide you with a quote.